Facebook had over 1.86B active users at the end of 2016, and its News Feed real estate has become a hot commodity. Between your friends’ content and paid advertising, Facebook posts on Pages are getting less and less airtime. As a content creator/social media manager/person paying attention to digital marketing today, I watched organic reach on Facebook lose its power, and turned to advertising to get content syndicated. You can get rapid market feedback by testing new messaging with a boosted post. Try boosting Facebook posts for a few dollars per day for 2-5 days to see how the market responds and engages with the content. 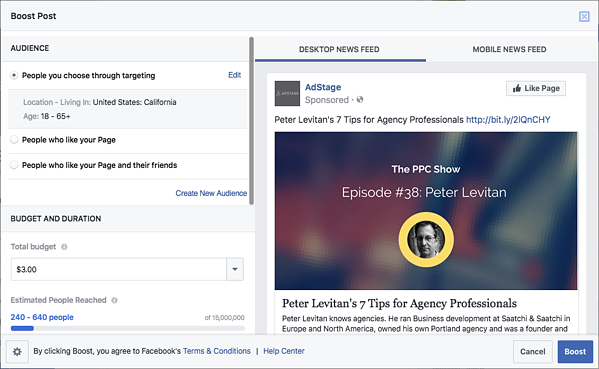 If it performs well, you can scale that messaging and creatives into your Facebook Ad strategy or other ad campaigns. Once you click “Boost Post” in your Business Manager, it’s just a matter of selecting your audience, budget, duration, and payment details. Unlike the full Power Editor or Ads Manager campaign set-up, you do not need to first choose an objective type, create an ad set, or select a bid or bid type. How easy is that? Here’s how easy the Boost Post UI looks in Facebook’s Business Manager. With boosted posts, you can test messaging with your Page followers, friends of followers, or your saved audiences from Facebook Ads. This makes it easy for you to syndicate more broadly if you want immediate results or if you don't have a large following yet. You also don't have to set up the audience every time so boosting Facebook posts can happen in a matter of seconds rather than minutes. As we know, Facebook’s Relevance Score is very similar to Google’s Quality Score in that you will get more impressions and likely cheaper clicks if it’s higher quality and more relevant. That said, if you’re noticing a post is getting more engagements than usual, you should boost the post because clearly it’s relevant to your followers or audience (we like Eric Siu’s rule of boosting posts with 3% engagement or more). Additionally, once you can see that it has an exceptionally high Relevance Score, you can actually add it to a campaign in Power Editor or Ads Manager. All you need to do is select the post ID as the ad for that particular campaign and you can now optimize for website conversions, video views, clicks, other objectives outside of page post engagement. Boosted Posts still follow the same guidelines as Facebook Ads in which the image must not contain more than 20% text. This means, while your content team and ads team can and should use the same assets, your business can also streamline the decision-making process when deciding which creatives to boost, syndicate, and turn into Facebook Ad campaigns. Two heads are better than one, and boosted posts brings your content and advertising teams together to work more closely as a stronger and more strategic business force. Let’s face it. Social media never sleeps, but humans need to. The great thing about boosting Facebook posts is that you can boost a post for your day off and you won’t have to worry as much about your traffic or engagement metrics dipping too drastically. Boosted posts give you the opportunity to finally take that vacation you’ve been eyeing on your lunch break. Just keep in mind that posts become outdated eventually, and Facebook only allows you to boost a post for up to 14 days, so don’t miss that flight coming home. 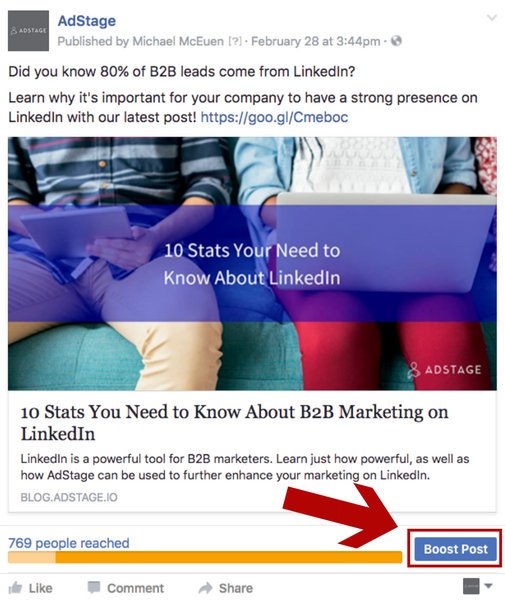 Have you tried boosting Facebook posts? Any best practices to share? Tell us in the comments below!